Cyndi Byars created this amazing Hat Size Chart. 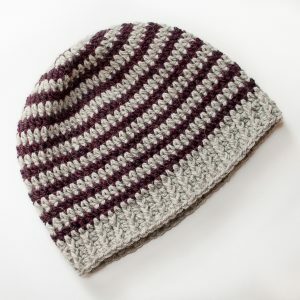 It’s such a great resource that takes the guesswork out of hat sizing for crochet and knit hats. That means you can customize any hat pattern to the exact size you need! 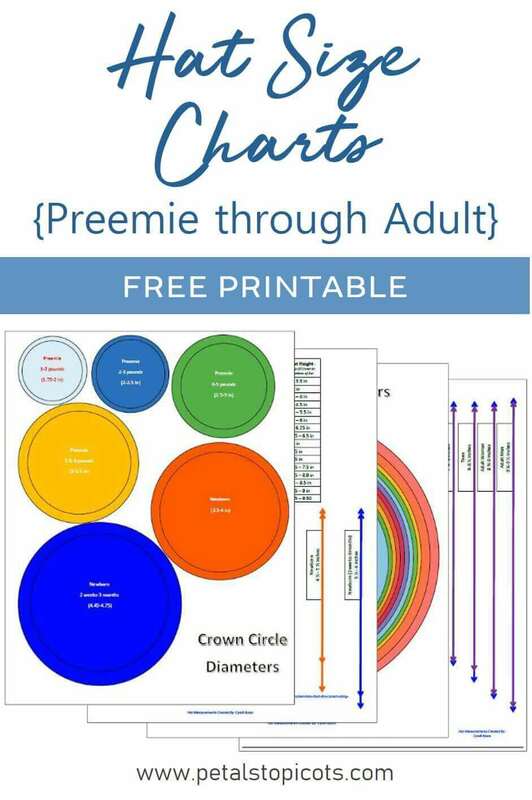 The 4-page printable includes a hat size chart that provides average measurements for hats ranging in size from preemie to adult. But the best part is that it also includes hat size templates for working the crown and height of every size. That way you can just compare your piece to the templates for the correct size … no need to measure! 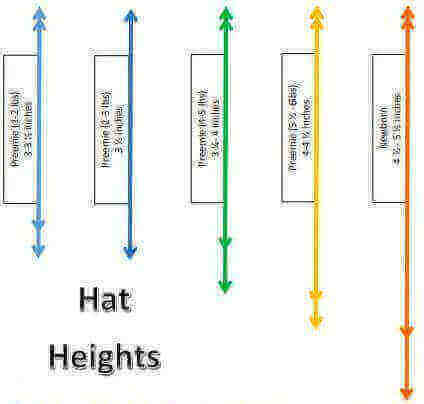 To download the free hat measurement guide, just click on the image below or the text below the image. To ensure accurate sizing of the hat templates when printing, be sure to set your print settings to 100% or actual size, not fit to page or scaling. 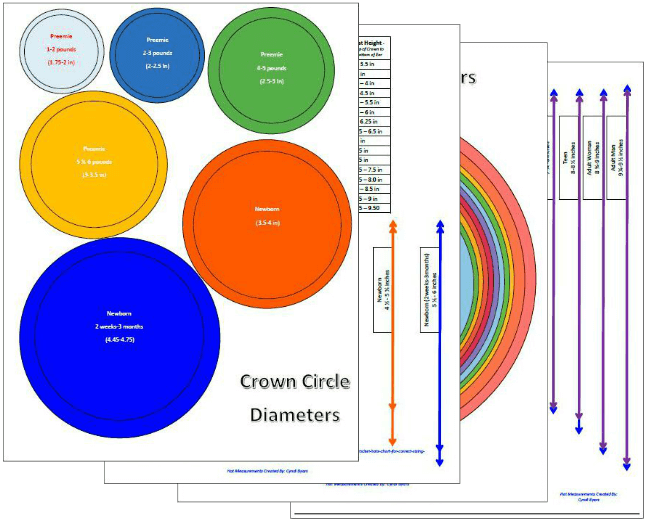 Once you have downloaded and printed the charts, you will find a series of circular templates for crown diameters, as well as a size chart and templates for hat heights. 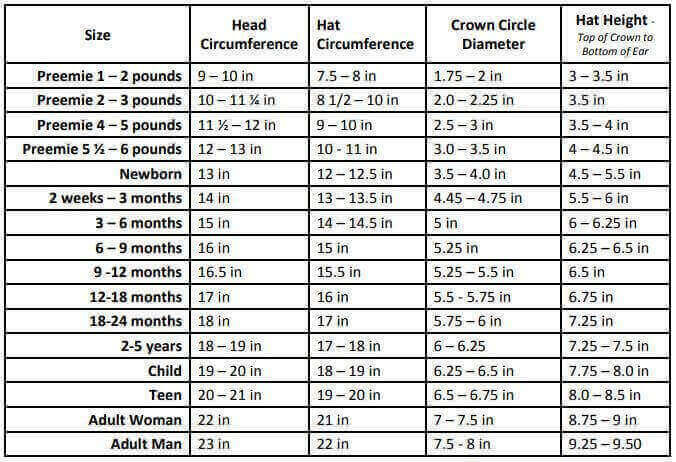 The following chart provides the average head circumferences for each age, followed by the suggested hat circumference, hat crown diameter, and hat height to fit that head size. Chart of hat size measurements by age. You can use the chart above on it’s own for all your hat sizing, along with a measuring tape of course, or you can keep things super simple and just use the templates as a guide for proper sizing (see below). Each circular template represents the crown size you need to increase to for that particular hat size. For example, if we wanted to crochet or knit a hat for newborn, we would stitch our flat circle until we reach approximately 3.5 – 4 in. across, or until it matches the size of the template. Then we can stop increasing and work evenly (that is, no more increasing) until we reach the hat height indicated in the hat height templates, in this case 4.5 – 5.5 in. And here’s a helpful tip! A few readers mentioned that they printed out and laminated the templates and used a key ring to keep them together and handy in their project bags. So smart! A huge thank you to Cyndi Byars for agreeing to share her Hat Size Chart with the Petals to Picots community!! Is there any chance that you could advise me as to how I could easily alter the pattern to make a hat for a 3 year old and for a 1 year old? I’m an experienced crocheter, but I have always worked from a pattern for a given size. The Hat guide is not as helpful for me. Hi Mary 🙂 For the hat for the 1 year old you can try this pattern … https://www.petalstopicots.com/baby-hat-crochet-patterns-sizes-newborn-through-12-months/ You will see that the first Rounds are increasing rounds that follow a certain sequence. To make a larger hat, like for a 3 year old, continue that increasing sequence until the flat circle reaches the diameter noted in the charts in the post above. Then work evenly, that is, 1 stitch in each stitch around until you reach the proper length, also noted in the charts in the post above. Make sense? OK, now to ask a crazy question: what exactly is meant by “CROWN CIRCLE Diameter”? Is that a few rounds down from the top circle? And then the “HEAD CIRCUMFERENCE” is what….the measurement around the forehead level? Sorry, but I’ve never had any of that explained to me before. The only hats I’ve made were the exact size of the pattern matched my own head. But now I’m needing to learn to make some for other people with larger heads than mine, and I realized that I don’t understand the terminology of the charts & how that correlates to placements on someone’s head. Hi Nancy 🙂 You are correct … the head circumference is the measurement around your head at forehead level. 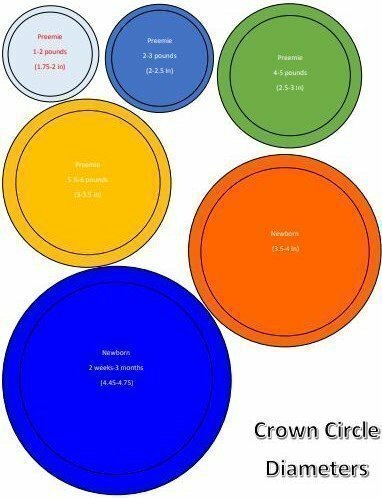 The crown circle diameter is the measurement across of the flat circle you are crocheting. For example, when you are crocheting the increasing rounds you create a flat circle; when the flat circle diameter measures the size on the chart, you stop increasing and then work the pattern evenly (that is, no more increasing). Hope that helps! Glad you were able to download it! I’m not able to get the hat charts. Nothing happens when I click on the link. I’m using my phone, would that matter? If you click on click here nothing happens but if you click beside it on hat measurements it works. I appreciate your hat chart so much you just made things so much easier for all of us! Hi Barb 🙂 If you click on the large font that says “Hat Measurments by Cyndi Byars” it will take you to the pdf. There’s no link for the hat size chart it just clicks back to this page again can you please supply the link for me? Exeecllnt tips, I often remove my glasses to blur things up a little. I enjoy working with linoleum and negative space is extra important when you have to remove so much of it. These are wonderful! Is it ok to share this this link, giving Cyndi full credit, of course? Such a great resource! I can’t get it to print out four charts. It just prints out the way it looks up on the top of the page, with them over lapping. I had the same problem but finally found the correct place to click on. Click on “Hat measurements by Cyndi Byars” which is in the blue color between paragraphs. very useful chart. Thank you so much for sharing. I have hat measurements plastered all over my bookmarks but this is fabulous!! I will have everything in one place. Thank you both so much for sharing! Great information!! Thank You and Cyndi for sharing! Thanks to you and Cyndi for sharing this! My hats are ALWAYS too short. This will help so much. Thank you for this amazing share!!! Wow! This will come in handy especially since fall is on its way. Thank you for finding this and sharing. My hat is off to Cyndi. He! He!